We all know that writing is rewriting. As much as we’d like for it to be otherwise, early drafts just aren’t ready for prime time. It is imperative that we reread and cut, revise and rearrange, polish and restructure, and cut even more until our manuscripts are as strong as they can be. One of the best ways I’ve found to assist in the quest for the strongest possible manuscript is my writing group—or, in my case, my writing groups. If you know me, you know that I’m a strong proponent of the “two heads are better than one” theory. And even more “heads” are better still. And that’s just what writing groups can offer. I am a member of an online writing group that has been in existence for eight years. We originally met on author Verla Kay’s Children’s Writers Discussion Board—affectionately known as the “Blue Boards” (http://www.verlakay.com/boards/index.php). This particular group meets only online, through a dedicated Yahoo listserv group, and our writing runs the gamut: rhyming and non-rhyming picture books, middle grade and young adult novels (including verse novels), nonfiction, magazine writing, teacher’s guides and so on. And just as our writing varies, so do our geographical locations; we reside in Canada, Virginia, California, Missouri, Arkansas, and even Brazil. When the group first formed, we followed a rotating schedule where one or two members would submit a story, chapter, or other piece of writing each week for the others to critique. Our schedule is less rigid now, as we currently submit only on an as-needed basis, but setting up a particular rotation can be a good idea. Just knowing that you have someone anxiously awaiting a new piece of work or a revision when your turn rolls around is a great incentive to keep writing. And the online format is wonderful because you can read and critique on your own schedule. Over the years, this particular group has morphed and changed. We’re no longer simply critique partners; we’re close friends. We no longer simply share our writing; we share our families, our worries, our joys and heartbreaks—we share our lives. We’ve been known to generate more than a thousand messages in a month! At this point, it’s as much a support group as it is a critique group. It’s amazing to be a part of a like-minded group of people who understand the importance of celebrating the small victories and who understand the agonies that can be a big part of this business. I have no doubt that I have been richly blessed to find such an amazing group of women. 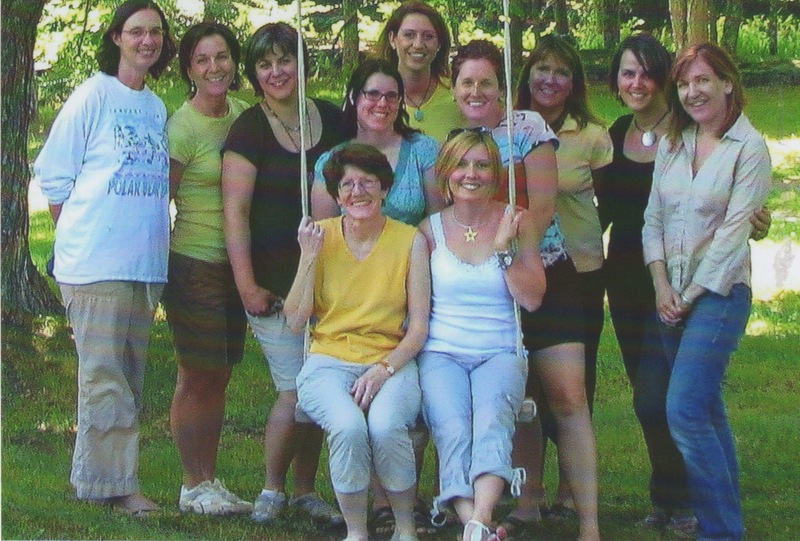 A couple of years ago, we finally had the opportunity to meet in person at Boyd’s Mills for a Highlights Founder’s Retreat (where we happily added five new and wonderful writer friends!). And that is truly the definition of awesome. But, wait. Maybe you’re not into all that warm and fuzzy feel-good stuff. Maybe you’re more the all-business type. There’s a writer’s group for that, too. My second group consists of eleven writers, and although several of the members write for all ages, this group’s focus is picture books. Again, the group conducts business solely online, we share our writing, and we all live in different areas, but that’s where the similarities to the other group ends. In this group, we spend very little, if any, time chitchatting. We don’t have a formal Yahoo Group where we exchange messages. We simply share email addresses, and when someone has a manuscript in need of critique, we send out a group email asking if anyone has time to take a look. Those who have time reply and offer their critiquing eyes. This “no-frills” group carries immense benefits as well. It is a group of published picture book authors who are serious about their craft and who more than willing to share their knowledge with other members—and those are important facets of a writing group, too. So which type of group is best? I find both groups invaluable. The members’ “fresh eyes” allow me to see my writing in new ways, and their constructive criticism helps me implement the necessary changes. They point out such things as awkward phrasing, places where my rhythm, structure, or pacing is off, or when my ending just isn’t quite working. They often call me on “logic” problems—“Ummm…this really doesn’t make sense.” And they often offer suggestions on how I might fix these problems. Do I use every single suggestion I’m offered? No. But I always try to keep an open mind. Even if I’m not sure something that someone’s suggested will work, I often go ahead and give it a try. And I’m often surprised by what I discover. Additionally, I’m continually amazed by what I learn from critiquing the work of others. If I’m reading a group member’s picture book manuscript, for example, and I’m enjoying the characters, the premise, but something’s missing that I’m having trouble putting my finger on, I begin to read more closely. I study the manuscript carefully until I (hopefully) discover what’s not quite right. Identifying these issues don’t only help the writer, they also help me when I’m working on my own manuscripts. It’s a win-win! Joining a critique group can be daunting. It’s easy to be intimidated. You wonder if your writing is good enough. It’s easy to be afraid of making the time commitment, and sharing your work with others can be downright terrifying. Additionally, some people worry that other writers might nab their ideas and claim them as their own. These are all justifiable concerns, but if you want to take your writing to the next level, it’s necessary to put yourself and your writing out there (I would, however, caution against putting your work on open online forums for all to see). So where might you find a group of your own? If you’re a member of the Society of Children’s Book Writers and Illustrators (SCBWI), contact your Regional Advisor to see if any groups meet in your area. While I’ve participated mainly in online groups, in-person groups are another option you can explore. Writers forming in-person groups, or searching for groups to join, sometimes post on bulletin boards at bookstores, libraries, or coffee shops. In-person groups usually meet at a regularly scheduled times and locations and often have a structured rotation for submissions. One thing I would suggest for these in-person groups is that you try to arrange to send your manuscripts to the group prior to the meeting rather than sharing them at meeting time. I have a difficult time critiquing “on-the-fly”; I prefer to read and reread a manuscript, put it away and ponder a while, and then reread and think some more before making comments. Whether you’re looking for an online or on-ground group, check out the message boards available at many writing sites including Verla Kay’s (http://www.verlakay.com/boards/index.php) and the SCBWI boards (http://www.scbwi.org then “Discussion Boards” then “Critique Groups”). These websites have boards dedicated to locating writing group members. Also, when taking either online or on-ground writing classes, you might consider forming a critique group with some of the other students in the class. When writing for children and/or young adults, I would also recommend that you find group members that write for these ages as well. You may even wish to “specialize” by looking for or forming a group in your specific genre. Fantasy writers may wish to join a fantasy-based group. Or you may wish to find writers who focus only on rhyming picture books, or chapter books, or verse novels, or whatever. I was lucky with my groups in that all the members seemed to have “clicked.” Sometimes, however, it’s necessary to try out different groups until you find a good match. Whatever type of group you decide on, one of the most important things to remember is to strive towards a combination of honesty and caring in your critiques—and that’s what you should expect in return. Whether it’s at a table in a cozy café or through the magic that is cyberspace, and whether it’s friendship-forming or strictly business, joining a critique group can be extremely beneficial. Writing can be a difficult, isolating process. Whether for encouragement, motivation, marketing information, strictly for the critiques, or for some combination of those, it’s a gift to be able to connect with other writers through a knowledgeable, dedicated group—because X heads are truly better than I! I just joined a writers group and love it. I was struggling with revision on my current WIP, I couldn’t pin-point what was wrong (but something totally was), so gave them my first few pages and they helped me identify my problem. The group is a bit of a mix of the two types you mentioned. Some of us go for a coffee and chat after meetings but a few just pack up their books and head off afterward. I only wish I’d joined sooner.